Everyone has something about them that they dislike, that’s a fact. Every time some one sits in my chair they almost always start by apologising for their ‘wonky smile’ or ‘uneven brows’ or something else that simply doesn’t matter. The truth is that as Ladies we give ourselves a really hard time when we don’t think we look exactly how we imagine ‘perfect’ should look. Multiply that by ten and that’s how we feel as brides. Everyone is going to be looking at you, you’ll be the centre of attention, it has to look perfect…does that sound familiar?! I’ll let you in on a little secret – no one is perfect. Nope, not even the gorgeous Michelle Keegan or flawless Jennifer Aniston. When people come for their preview sessions and style trials they will often bring along pictures of airbrushed celebrities with a desire to look just like that. Of course, on your wedding day you want to look your most beautiful, but you always want to look like you. 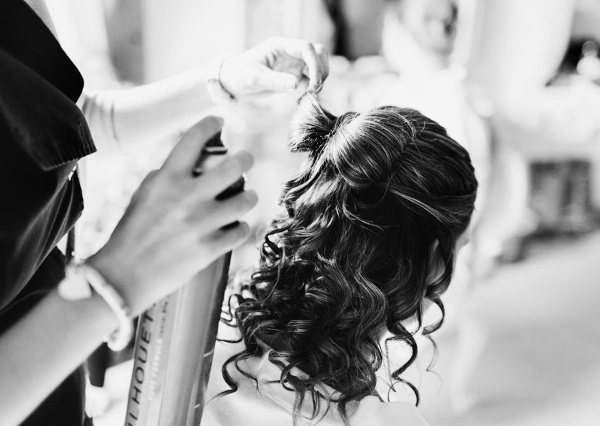 I always tell my brides that you simply want to be an enhanced version of yourself. The ‘you’ that you could quite easily achieve if you had three hours every morning and an extra pair of hands, trained specifically for that purpose, to help you create it! A big part of your day is your photos, after the day itself has passed , alongside your memories all you have are those images captured by your photographer to remind you or just how wonderfully it truly was. You certainly don’t want to look back upon those pictures and wish that you had invested a little more in a professional for the guarantee that your hair and make up would be exactly how you wished it would. I get a lot of last minute enquiries from bride to be’s that had opted to use a ‘friend of a friend’ or a ‘cheaper’ alternative, and whilst some of them are so lucky – finding some amazing new talent and stylists with real skills who are building a name for themselves – so many of them aren’t so fortunate. Brides have called me in tears the night before their wedding, begging for help when their ‘cheaper alternative’ has text to say they wont be turning up the following day. Of all the things that you invest in on your wedding day and all the ways in which you choose to allocate your ever growing wedding budget , be sure that you don’t compromise in areas that you will regret later. Bridal hair and make up is what I do, It’s what I specialise in, and its what I love. The way you look on the very best day of your life is a very big deal – not just on the day, and not just for you- but for the next 50 years that you’ll spend looking at those amazing photos that yourself and your family will put up in pride of place on their mantelpiece or hang on their wall. (No pressure then!) If you’re looking for someone who can help you and work with you to create the very best version of you, for the very best day of your life then please do get in touch – I look forward to getting excited about your wedding with you!